A super new piece for Christmas 2010. 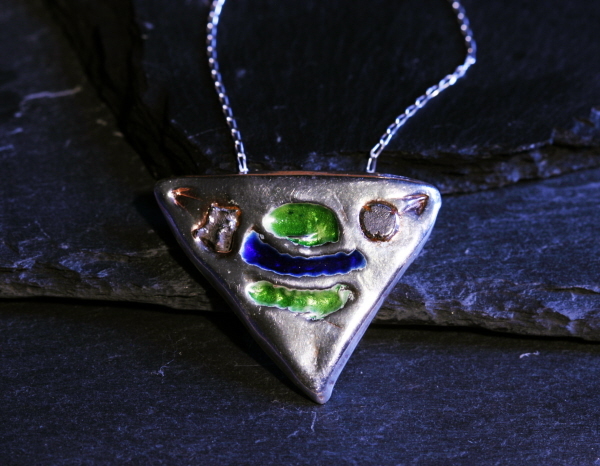 A solid silver triangle is set with an exquisite enamelled Saturn symbol and is then decorated with 3 fragments of real iron meteorite. The meteorite is Campo Del Cielo. What could be more thrilling than to wear a beautiful piece of jewellery complete with something from outer space! The Silver necklace is strung from an 18 inch solid silver curb chain and boxed in a stunning black velvet lined jewellery box along with a signed certificate of authenticity. You will simply not see anything similar anywhere else!